We’d love your help. Let us know what’s wrong with this preview of Digitox by Mark Ellis. Digitox is the story behind Mark Ellis and his family’s decision to create “Tech free Sunday’s”. A day where there is no Internet usage – by choice. Meaning no email, social networking, texting or You Tube. Not even checking the weather forecast. 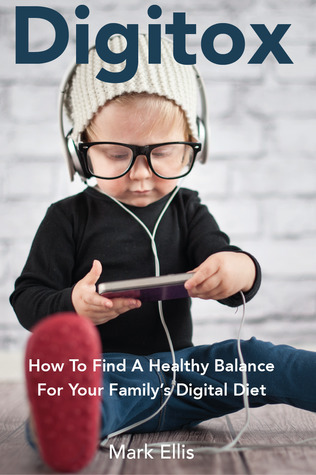 The book covers their experiences over a three-year period and highlights the chall Is your family spending too much time online? Mark and his wife Caroline have four children Ben (17), Gabriel (15), Jessica (13) and Noah (7) with Mark being a self confessed Tech Addict. A few years ago they realized that technology was impeding their family life – arguments were breaking out over which TV show to watch, the Wii caused more fights than they care to remember, Mark looking at his phone during a meal while Caroline watched a show on the kitchen iMac. Sound familiar? The solution - it simply started as a day of banning the Internet, which turned into a family mission to take a step back from the digital age for one day a week. To ask other readers questions about Digitox, please sign up. Excellent and well worth a read! I shall be passing this book on to my daughter to read, who has two children who claims their life's will be over if they didn't have their mobiles etc glued to their sides. I do recommend. An excellent and timely read - when more and more of us are becoming reliant on our phones, iPads and everything else digital, this is a wake up call to anyone but especially those with children. I'm terrified of the forthcoming teenage years and want to navigate through them with my daughter on an even keel, I think that this book and the issues raised will help me plot our way. The tone of writing isn't at all smug or condescending but illuminating and trustworthy. Awesome and inspiring read. Made a real difference to how we live our lives with tech. Mark Ellis is the father of four children, a tech industry veteran of 20 years and the author of Digitox - a book that will make you and your family happier, healthier, safer and smarter in a society that increasingly demands constant, unsustainable attention. Mark was given his first computer aged 10. After graduating with a first class honours degree in Business Studies & Technology he joined Mark Ellis is the father of four children, a tech industry veteran of 20 years and the author of Digitox - a book that will make you and your family happier, healthier, safer and smarter in a society that increasingly demands constant, unsustainable attention. Mark was given his first computer aged 10. After graduating with a first class honours degree in Business Studies & Technology he joined Dun & Bradstreet and has since spent over two decades in the technology and software industry, working all over the world for several multi billion dollar companies. Mark has been a guest on BBC Radio 4’s flagship Today program, BBC Radio Oxford and Jack FM and together with his family has also been featured on BBC Sunday Morning Live, in the UK and USA national press, and in other publications including Grazia and Oxford Life Magazine. Outside of his professional life, he is a co-founder of Red Trouser Day, a charity raising money for bowel cancer research and a co-founder of FLTR coffee, a not for profit coffee shop in the heart of a local housing development.